I had plans to throw a little Thanksgiving brunch this month before the Christmas season rolls around and everyone really is too busy to get together. Unfortunately, some things came up, so I'll be saving these notes for next year...or maybe tailoring for Christmas. The major underlying themes for me this year are simple, inexpensive, and casual. But time is short these days, so I'd stick with good old Evite. If you haven't tried Evite before, it's incredibly easy to sign up, create a cute invitation, and track your guest's responses. There would be no fancy tablescapes. This guest list is made up of the juicebox and crackers variety. 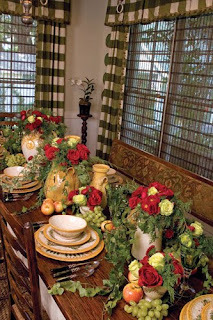 I think the beauty of my Dining room centerpiece of "sugared" pumpkins, apples, and pinecones would be lost on them. 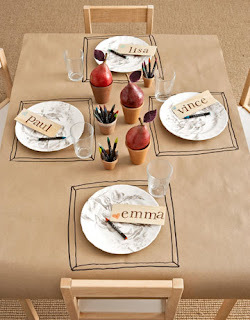 I love this simple kids' table from Country Living. The crayons as a centerpiece give the kids something to do while the moms dole out snacks. I have a small child-size table, but it only seats two and the last thing I need is a rumble over which preschooler gets to sit at the table. An easy alternative is to create a little picnic area in your Living room. I found these cute plastic Table cloths in Target's $1 bin section, along with the doilies. You could use the doilies as "coasters" for each child's juice box, and the leftovers can become decorations or craft projects elsewhere. One of my additions to the buffet table this year would be a new recipe for Pumpkin Spice Muffins that my sister gave me recently. I'll be posting the recipe soon, so be sure to stop by! Kids are usually fine with goldfish and juiceboxes. Their final course of the morning could be these adorable Turkey Cookies from Pillsbury. I am so trying these! To keep the kiddos occupied while the moms enjoy brunch, visit websites like Family Fun or Kaboose for fun and easy printable Thanksgiving-themed coloring pages. Hand out some crayons from The Dollar Tree, and you're guaranteed at least 30 seconds of chatting/eating time with your friends. When the bebes tire of artwork after those 30 seconds, put on a Thanksgiving video like "Garfield's Thanksgiving" (my girls love it!). If you have Verizon's digital cable, you can find free cartoons saved by theme/current holiday. 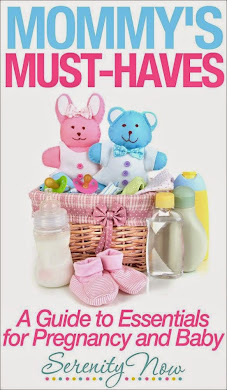 If you are a good mom ambitious, you could also visit the aforementioned sites for supervised craft ideas. Me, I tend to crave grown-up time...any grown-up time, and I know my girls would be fine playing with their friends or (gasp!) watching a short video so Mommy doesn't go bananas. When the moms have scarfed down all the delicious food they brought to share, have everyone gather together for a game of "Pin the Hat on the Turkey." I found this game last year in Target's clearance section, and saved it for Natalie's preschool Thanksgiving party. You could easily make your own with some white poster board, brown, red, and yellow crayons and a bunch of different colored construction paper "feathers." Give the winner (or each child) a lollipop or small prize (Dollar Store necklaces are great), or just let them play until they are exhausted. Then you can sit them down for a story while the moms clean up and get diaper bags and empty platters in the cars. Twas the Night Before Thanksgiving is super-cute. My girls love the rhymes, the illustrations, and the story of the family gathering to celebrate. We also enjoy The Story of the Pilgrims, which is a great history lesson for little ones. Although now Natalie (almost 4) wants to know if the Indians will be dining with us next Thursday. I hope you found some fun ideas today. Please visit Kimba at A Soft Place to Land for more fabulous Do It Yourself project ideas! The Christmas season will be here all too soon...check back in here at Serenity Now for more fun! It's Day #16 of 27 Days of Thankful. Click the link to find out what's going on here every day in November until Thanksgiving Day. Today, I am thankful for opportunities to gather with friends. Please, only link up with thankfulness-related posts! Please include a link back to this specific post. Thanks! Wow! You have a lot of fun things planned! These are cute ideas! I love the kid's table covered with paper. What a cute idea... I love the kid's table... any kids would love that set up. Sounds like an awesome party! I would love to bring my girls to a gathering at your place! Friend time is definitely something to be grateful for! I cherish it so much more now than I did when I was younger! The ideas are great! Thanks for sharing them. And I'll be lookin for that pumpkin spice muffin recipe. Sounds good! Cute ideas! I love those leaf doilies, I didn't see those at our Target. 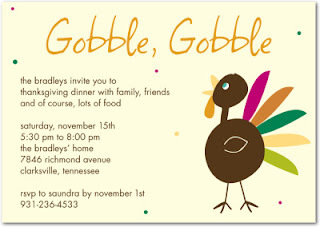 We are hosting a Thanksgiving brunch too, it should be fun. What a cute idea! I'll have to remember that for when my little one is bigger. Thanks for visiting my blog! 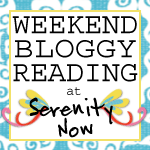 You have a DARLING BLOG--I signed up to follow and hope you will come over and do the same.